In 1966, the American Bible Society published a new translation of the Bible called Today’s English Version. My copy is identified on the spine as The Good News Bible. The paperback New Testaments were marketed as “Good News for Modern Man.” In our current climate of political correctness, that title doesn’t fly. In these matters, I am distinctly and happily old-fashioned. It is perfectly fine for me to read the Bible—no adjectives required. Someone might be forgiven for assuming that if it is the “Good News” Bible, perhaps there is another version bearing different news—maybe bad news! One of my treasured possessions is my father’s Bible. It is red leather, and he liked to tell me that the best kind of Bible is a READ Bible. It is an awesome responsibility and a wonderful privilege to teach the Bible and then to see its reach multiplied by way of radio and online. As you can tell, I am surrounded by a team of people who are wonderfully talented and equally committed to distributing the teaching in as many ways and to as wide an audience as possible. 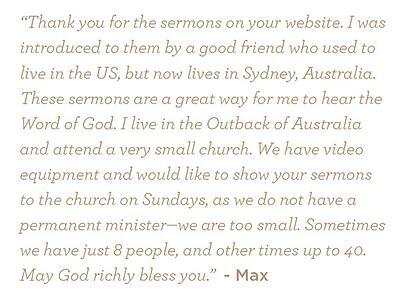 I am staggered to see the breadth of the ministry’s impact. Whether it is hearing from a single parent in south Texas, a soldier in Afghanistan, or from a member of a small pastorless congregation in the Australian Outback, the story is always the same: God’s Word does God’s work, opening blind eyes, softening hard hearts, and equipping believers to be about the ministry of the Gospel. These are all testimonies from our mailbag. I hope you are as encouraged as we are, because this would not be happening without you. If you’ve been looking for an opportunity to expand your part in helping the Gospel go out, I hope you’ll consider becoming a Truthpartner. We’re praying that God will broaden this enabling team by a significant number this month. When you come alongside us as a Truthpartner, we’ll invite you to routinely request both of our monthly resource offers. They collectively cover a wide range of topics and this month is no exception. Tough Questions about the Bible draws from questions asked by middle schoolers. It’s a helpful book that the teenager in your family or church can read on their own. Can I Really Trust the Bible? explains how Scripture validates its own truth. It’s a good topic to revisit and a great book to pass along to a questioning friend. Finally, this month, we have a special message on CD we’d like to send you when you become a Truthpartner. It was preached by my good friend Terry McCutcheon who presents salvation in Christ in a way you’ll want hear—and share! Again, thank you for all you do for the Gospel through Truth For Life. P.S. Visit truthforlife.org/iListen and add your picture to our family of listeners.